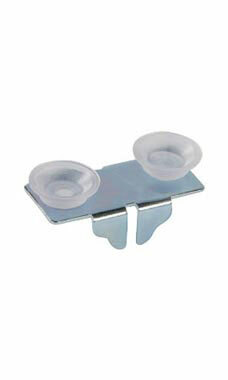 These Glass Shelf Clips with Rubber Bumpers protect your shelf and helps prevent sliding and movement. To use, simply slip the shelf clip onto the rear or center of a shelf bracket. That's all you have to do! Designed for use with glass shelves, but can protect any shelf from scratching from moving. In stock and available for immediate shipping. Excellent product, fast shipping. Wonderful customer service. Highly recommended company. Using these makes us feel more comfortable with our glass shelf stability. We use both the front and back clips. These are great for the glass shelves in my display cases , they keep the shelves in place. worked just fine and the price was good. fast shipping and great customer service as usual!